Because the experience of reading involves what the author puts in a book and what a reader brings to the book, there is a small but important difference between a "Best of List" and a "Favorites List." For our final post of the year, we are each posting a list of our favorite books from 2012. We know that we will not include many wonderful books written this year, but we happily and wholeheartedly recommend our favorites. tara's list: While these books may not be my top "award winners," they are books that I enjoyed reading and that will stay on my shelf for future reads. When you have 37 grandchildren, trying to find Christmas gifts for each of them can be a daunting task, but my mom started a tradition back when she only had a few grandkids, that simplifies that task a bit -- she gives picture books. She buys books throughout the year, matches books to specific children, and includes a personal note in the front of each book. My children, from my youngest to my oldest, love getting Grandma Books. They read them over and over and even have a special shelf to keep them on. Years ago when my family was moving from California to Virginia, the movers required that we list items of "extraordinary value." My oldest son, who was twelve at the time, begged me to include his Grandma Books on the list so the movers would be extremely careful with them. My kids love watching their special shelves fill with books, and I love that they never outgrow picture books. King Bidgood's in the Bathtub by Audrey Wood is the story of a king, who despite the efforts of his court, refuses to get out of the bathtub. Repetition and humor in the text illustrated with Don Wood's detailed oil painting make this a terrific read-aloud book. Muncha! Muncha! Muncha! by Candace Fleming uses repetition and onomatopoeia to tell the story of some hungry bunnies and Mr. McGreely who is trying to protect his garden. Illustrations by Brian Karas give life to the busy bunnies. Bob Shea uses bold black lines and vibrant color in Dinosaur vs. Bedtime to illustrate the Dinosaur who conquers the world around him, but finally succumbs to sleep. When I become a Grandma, I think I'll adopt this tradition if only to have an excuse to visit the bookstore more often. I was always excited when my mom took the Christmas books out from the closet and set them on our bookshelves, and I was always even more happy when she--on occasion--would let me read them. The one book that I always went for first was Where Did They Hide My Presents: Silly Dilly Christmas Songs. I read this every season, and still, never got bored of it. I even started to memorize it, still pulling the book out to look at the pictures, and remember some of the songs I was missing. One of the songs that I still remember today was about a kid and his parents who were shopping. When he finds out that they are shopping for him, the poem continues as he begs to stay. The poems are really fun and easy enough for little kids to sing. The pictures contribute to the hilarity of the book with exaggerated proportions and general silliness. It is a magical thing to pick up a picture book and share a story. Some picture books rely on a funny joke or unexpected turn of events to draw you in. While others, like this retelling of a Brother’s Grimm story, is all about the story. I love all kinds of picture books, but sometimes it is really nice to feel like you are relating something that could have possibly happened in true storyteller form. This is one of those stories that you could tell without the book - but why would you want to when the pictures are so wonderful? 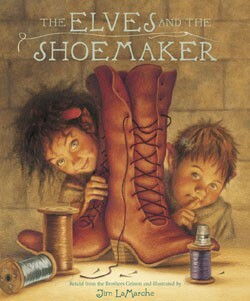 If you have never heard the story of The Elves and the Shoemaker, it may seem a little unconventional. You have a poor shoemaker and his wife, who are down to their last piece of leather for their last pair of shoes, when something unexpected happens. The leather, cut and prepared by the cobbler the night before, is magically turned into a beautiful pair of shoes – all while the cobbler and his wife are asleep. They can’t believe their eyes, and fortune continues to smile on them when a wealthy man comes in and buys the shoes for double their price - allowing them to buy leather for 2 more pairs of shoes. Jim LaMarche fills this book with delightfully warm and richly detailed pictures that completely bring the story to life. Just as this tale is perfect for reading out loud, the pictures form a story on their own and you can’t take your eyes away from them. Seeing the shoemaker cut the leather with his extra-large scissors or catching a glimpse of the elf peeking through the snowy window add extra dimension and thoughtful character to the story. I always pull this story out with our Christmas books, not just because it has a few elves in it, but also because it is a story about giving and helping each other. It feels like the perfect reminder of how a little kindness can go a long way and how we all just need to look out for each other. I love this list from Horn Book, especially since it includes many of my favorites from this year: Horn Book Fanfare 2012. For many people, day-after-Thanksgiving activities include shopping, enjoying leftover turkey, and hanging Christmas lights. At our house, we pack away the autumn, Halloween, and Thanksgiving books and pull out the Christmas books. Most of these are picture books, but a couple of them are nonfiction books that center around Christmas. One of my favorites is Jim Murphy's Truce: The Day the Soldiers Stopped Fighting. Murphy begins his account by briefly outlining the political complications and ambitions that started World War I and describing the propaganda from both sides. He tells about weapons and battles, giving just enough detail to help the reader understand the horrors of the war, describing particularly the realities of war in the trenches. Then with the soldiers in trenches, facing each other on either side of No Man's Land, he explains how on Christmas Day 1914, defying orders from their commanders, tens of thousands of soldiers, in a series of impromptu truces, stopped fighting. Many met on No Man's Land; some exchanging gifts, others burying their dead and holding services, and still others, taking pictures. First-hand accounts give insight into motivations of the soldiers and show a shift in their feelings toward each other. At the onset of the war a young British lieutenant expressed his enthusiasm for joining the fighting, "Our major anxiety was by hook or crook not to miss it" (17). And just a few months later a German officer reported, "When the order to fire was given, the men struck . . . the officers . . . stormed up and down, and got as the only result, the answer, 'We can't -- they are good fellows, and we can't'" (86-87). These moments fill the story with humanity, making it personal and real. 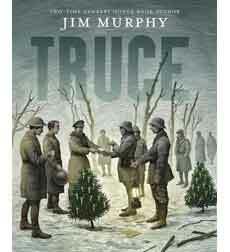 Murphy also incorporates sentiments of those who didn't want the Christmas truce, including a young Adolph Hitler ("Such a thing should never happen in wartime. Have you no German sense of honor left at all?") and German and British commanders who threatened those who were friendly with the enemy ("Commander Second Army directs that informal understandings with enemy are to cease. Officers . . . allowing them are to be brought before a court-martial."). But above all the story is of the men who had the courage to step out of the trenches and take a chance on peace. What makes this feel like a Christmas book to me is not the fact that the informal truce occurred on Christmas, but the miracle of the truce itself -- the spirit of forgiveness and brotherhood that triumphed over hatred at least for one day -- as expressed by a British soldier, "This experience has been the most practical demonstration I have seen of 'peace on earth and goodwill towards men'" (81). Plenty of photographs and illustrations depict the fighting and the friendliness. I especially enjoyed the photograph of the German soldiers singing Christmas carols in the trenches on Christmas Eve. A timeline, notes and sources, and index are appended.